After I threw up in the car on the way to NY, I felt MUCH better. Mom just rolled her eyes when I told her that my vomit kinda looked like applesauce. 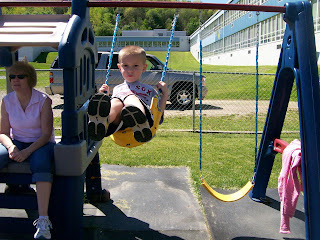 I learned how to pump my legs on the swings! 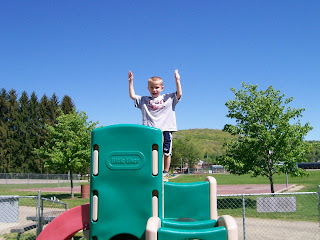 I was (I mean, AM) King of the World! I try, anyway. 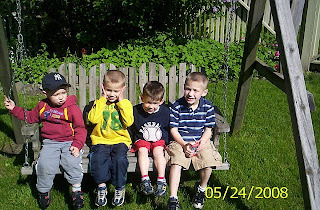 It's tough to be the middle child. We put big rocks across the creek to make a bridge. 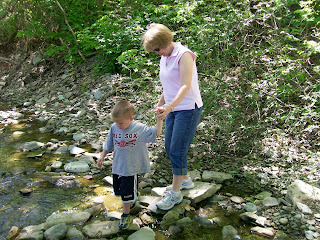 But the rocks were heavy, so my Mommy did all the work, and then Grandma helped me across. 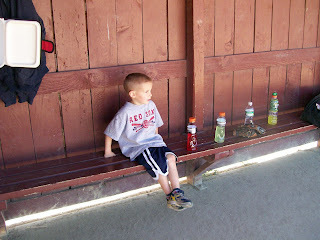 I was the official benchwarmer when my big brother was playing ball. No one saw me, but I sure enjoyed sampling all those drinks. Germs, schmerms! Love the points of view! Adorable...looks like you had a wonderful reunion with NY. Glad you had fun!! I'm enjoying these posts. Can't wait to hear what Baby has to say (tomorrow?). Oh it's so much fun to read the different kids perspectives. It sounds like they had a great trip. Will we be getting baby's update tomorrow? I hope he didn't have anything contagious, or the rest of the team is in for a big surprise this week! love how you are doing this!! oh what will baby say?